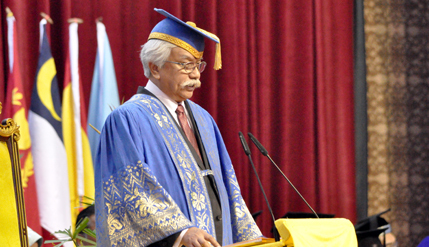 BANGI, 1 November 2014 – Tuanku Muhriz Ibni Al-Marhum Tuanku Munawir decreed that The National University of Malaysia (UKM) must remain devoted to its original objectives even though it has achieved international success. The UKM Chancellor said he considers it successful if it continues serving the hopes and aspirations of the people for higher education. Addressing the first session of the 42nd UKM Convocation here today, Tuanku Muhriz said eventually the university must contribute to the development of life and civilization of the country. Tuanku Muhriz, who is the Yang Di Pertuan Besar of Negeri Sembilan stressed that the objectives of UKM to empower the Malay language to also be a medium for science should always remain. He expressed a sense of pride that UKM has succeeded in improving its position in the world’s universities rankings at number 259 making it among the top 1% in the list of the rankings. Tuanku Muhriz said that UKM’s reputation would not be possible without the dedication of the people it serves. He is also happy that for the first time UKM has invited its alumni members to attend the convocation saying that they can become role models of responsibility to society and the nation. He advised UKM graduates to do their best to shine in strategic areas when they go out. Some 6,266 are graduating at the 42nd convocation which continues until this tuesday.